Recently Sterling Publishing sent me a few of their fall titles to peruse and there were two in particular that stood out to me that I thought were rather fun and wanted to introduce you to. With a title like that, how could I not be intrigued?! Calvin lives with his three brothers, four sisters, and sixty-seven thousand four hundred and thirty-two cousins in an old barn. ("Starlings have BIG families.") While all of the other birds are doing bird-like things, such as hunting for worms and flitting about in water, Calvin prefers to spend his time in books. In fact, he spends so much time reading that he missed his flying lessons with Mr. Wingstead! Where was Calvin when he was supposed to be atop the telephone wire, learning to spread those wings and fly? Why, he was at the library, of course! 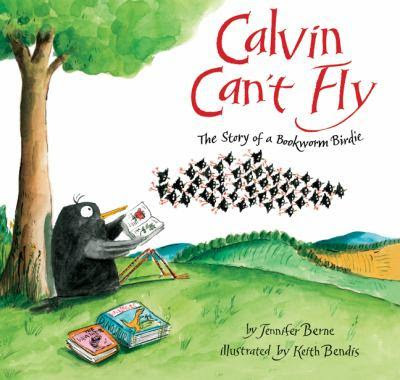 Now, a bird that doesn't know how to fly could be in a spot of trouble but Calvin didn't seem to mind. He preferred his adventures in book form. However, he begins to feel a wee bit sorry that he didn't spent just a tad bit of time learning to fly when it came time to migrate. He starts to feel very sorry for himself indeed but it turns out that his reading comes in handy in saving the flock from a hurricane. Having read about such storms, Calvin was able to give his feathered friends some life-saving advice and so the other birds learn to appreciate a little book learnin'. This is a cute, fun book that celebrates a love of reading and we enjoyed it. The text in this book are the lyrics from the song of the same title by Bob Dylan. I confess I had never heard a Bob Dylan song before in my life before receiving this book. So I listened to the song and I found it, admittedly, very annoying in a repetitious sort of way. There's not a whole lot of imagination or variation in the lyrics or the song itself. Forgive me if you are a Dylan fan, but I am not. What makes this book interesting to me is the illustrator - Jim Arnosky. I wrote up about a week's worth of posts about Mr. Arnosky over at Reading My Library and if you are interested in learning about his books, then I'd point you in this or this or this direction. I think he is a FABULOUS illustrator and we absolutely love the way he opens up the world of animals to young readers. He is passionate about the animal kingdom and it shows in each one of his books. 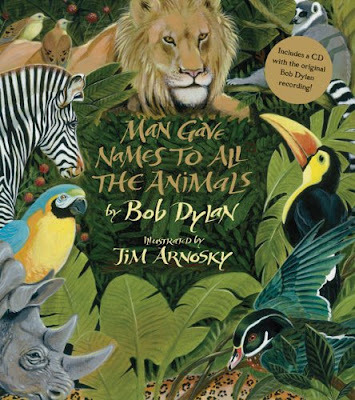 We love looking through Man Gave Names to All the Animals because of the detailed and excessively beautiful illustrations by Arnosky. (I confess I don't really care to read the book as it reads awkwardly, being birthed from an awkward song.) But the illustrations!?!? Ahhhh! Arnosky is the reason I would recommend this book. But do learn more about him if you pick this one up and give it a whirl because he has so much to offer as an author and illustrator in his own right. He's just brilliant when it comes to making children and animals friends! I'm now delighted to let you know that Sterling Publishing has offered TWO (!) sets of these books to two of you to enjoy. To win? Simply leave a comment below! This contest will be open through next Thursday, September 23rd, and is open to U.S. Residents AND Canadian Residents. Thank you, Sterling, for allowing us the opportunity to sample your fall books and I thank you, on behalf of Reading to Know readers, for giving few others the chance to get to know your work! THIS GIVEAWAY IS NOW CLOSED. THE WINNERS ARE #28- Katrina @ Callapidder Days and #10 - Krista from Welcome to Married Life! Congrats, ladies! No entry for me- just wanted to say that I got these as well and I'm absolutely IN LOVE WITH CALVIN! It's my new favorite read aloud, and I just crack up every time I read, "Ah yes, migration. I've read about that." I would love to be entered. These books sound great, and I know my boys would love them. These books would be great to have. The first for the story line, and the second for the illustrations. My youngest child has an eye for well done illustrations in books. Please enter me in the drawing. Awe. These are adorable! I especially like the sound of Calvin Can't Fly. I hope to read it soon!! Please enter me in the giveaway- especially the bookworm book looks fun to read! With that said, please enter me. I think you know how to find me. Yay for more books! ;) I just realized that our 4 shelf bookcase that was only 1 1/3 full when we moved is now 2+ shelves full... whoa! In just 6 months! I love that Calvin is rewarded for his reading! And I'd love to win it and share with my boys! I would love to win these for my grandsons! They sound really good! Great giveaway! I'd love to win them for our church Toy Drive. I totally want to give as many books as possible. I think my daughter would really love these. Please count me in. Thank you. What a wonderful giveaway. Thank you for the opportunity! Oh my kiddos would absolutely LOVE those! Thanks! I would love to share these great books with my grandchildren. Thanks for the chance. Sounds great, and I'd love the chance to win! Dawn HAS talked up Calvin! We are actually doing a giveaway of that one as well, Monday 9/27 at 5minutesformom.com. I love the illustrations in children's books. I'd love a chance at winning this book! A few weeks ago, we were at the bookstore and the Calvin book caught my eye. We read it [gently] while we were there (in a store that allows and supports that sort of thing), but would love to win a copy of our own. Loved it! My 3 yo is book obsessed. All her activities seem to either be book centered, or she carries a book with her when she does them. Sounds a bit like Calvin. Thanks! Both of these books sound wonderful, thanks for the giveaway!